Stitch up several of these for handmade holiday gifts this year! I promised another snowman pattern a while back and here it is. This one I made for my daughter and she picked the bright colored hat and scarf. This new free pattern is for a bit taller one than the last free crocheted snowman pattern I posted. As with the other pattern, this one is also very quick and easy to make using cotton yarn. 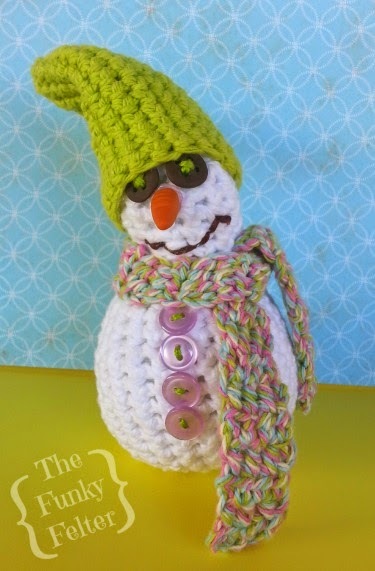 This amigurumi snowman body can be stitched up in about an hour (or less if you are fast) with the accessorized hat and scarf taking about the same amount of time. Find the craft tutorial for the polymer clay eyes and nose here. These are also very simple to make quickly with very little skill needed. I used embroidery thread to stitch on the crooked smile and buttons down the chest. Note: At this point, I recommend you flip the snowman right side out if you prefer it that way. I left mine wrong side out as seen in the photo. Do whatever you prefer. Then stuff it with polyfill before starting the decreases in the next rounds. Also, if it becomes difficult to decrease down to the 3 sts. in Rnd 23, you can stop in the previous Rnd, tighten and tie off. I like to decrease as far as possible personally, but do what works for you! Ch. 5. In 3rd chain from hook, hdc in each remaining ch. (4 sts. total with first two chains counting as the first stitch). Ch. 2 and turn. Then [hdc in each st. across, ch. 2, turn] repeat rows until the scarf reaches about 12 inches in length. Tie off and weave in ends. Note: This is a very simple length of half double crochet stitches forming a skinny scarf. You can use any simple stitch you like for this including single crochets or double crochets, or a combination of repetitive stitches. Be sure to accommodate the first stitch with the appropriate amount of chains though so you don't end up with uneven rows. Note: For the cone shaped crocheted hat, I used this craft tutorial by Cara Medus on forming amigurumi cone shapes as a guide. 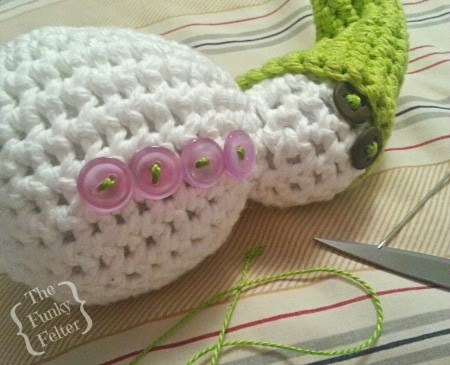 The photos and written instructions are very helpful in creating all sorts of handmade crocheted hats. The instructions below are my own unique adaptations for making my crocheted snowman's cone hat as seen in the photo. Rnd 3: 2 sc in next st, sc in each remaining st. (9 sts.) .....and so on, increasing by 1 stitch for each new round. For the nose and eyes, you can use my polymer clay craft tutorial or improvise. I used embroidery floss to stitch on a mouth and the chest buttons. I also used the same thread to stitch the hat and scarf in place. Like my little crocheted snowman? I have new patterns and holiday craft tutorials coming up soon. Be sure to follow me or subscribe to my feed on the sidebar to get those posts. Don't miss out!